Massage has been used therapeutically for many centuries; there are references to varying massage techniques in Chinese documents from the very beginning of recorded history. Over time, many different styles have been developed, each of which uses differing techniques to achieve their desired effects. Swedish massage, also referred to as classic massage, uses five kinds of long, flowing strokes, and has been shown to be particularly helpful in reducing pain and joint stiffness in patients with osteoarthritis. A study in 2010 showed that Swedish massage causes measurable changes in immune and endocrine responses in healthy adults, showing that it can be beneficial to any recipient. Compared to Swedish massage, deep tissue techniques are slower and use more pressure, in order to reach deeper layers of muscle and fascia (connective tissues). 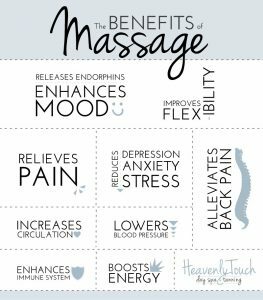 Studies have shown that deep tissue massage can have a beneficial effect on blood pressure, with an average drop in systolic pressure of 10.4 mm Hg, and it is also reported to be effective at relieving chronic pain. Although developed specifically for the benefit of athletes, many sports massage specialists such as London-based Technique Physio report beneficial responses from all walks of life. Sports massage tends to be a deeper form of therapy, using deep tissue techniques and trigger point therapy to decrease tension within muscle tissue and restore optimal muscle length. For athletes, one of the key benefits is prevention or reduction of DOMS (Delayed Onset Muscle Soreness) after exercise; for more sedentary recipients it can improve circulation and reduce stress, as with other massage techniques. This is an ancient Chinese practice; according to practitioners such as Rosanna Bickerton at Hands on Feet, reflexology promotes health by manipulating pressure points on the feet, hands and ears which correspond to other organs, glands or structures of the body. Whilst this cannot be proven, studies have shown that it can aid in reducing pain, blood pressure and anxiety, and it has shown beneficial effects for migraine and tension headache sufferers. Whichever form of massage is recommended, it is important to ensure that certain contra-indicatory factors are not present; massage should generally not be used on patients with bleeding disorders or who are taking blood-thinning medication, deep vein thrombosis, severe osteoporosis or fractures, and care should be taken with oils and lotions, as they may cause allergic reactions in sensitive patients.